Vulcan Events — Away Mission Orlando 2012 was another great time spent with friends and spreading the good word of the dark and light sides of the force. Avery Brooks was the headliner for the event and while I’m a fan of Star Trek: Deep Space Nine , my excitement was in getting to meet Robert Duncan McNeill (Tom Paris, Star Trek: Voyager ) and getting a picture of Dirk Benedict (Starbuck, Battlestar Galactica ) for my mom. The convention spanned three days in October at the Hilton at Downtown Disney in Orlando, Florida. My husband and I split up “Brandon watch” duty so we could each troop a day. 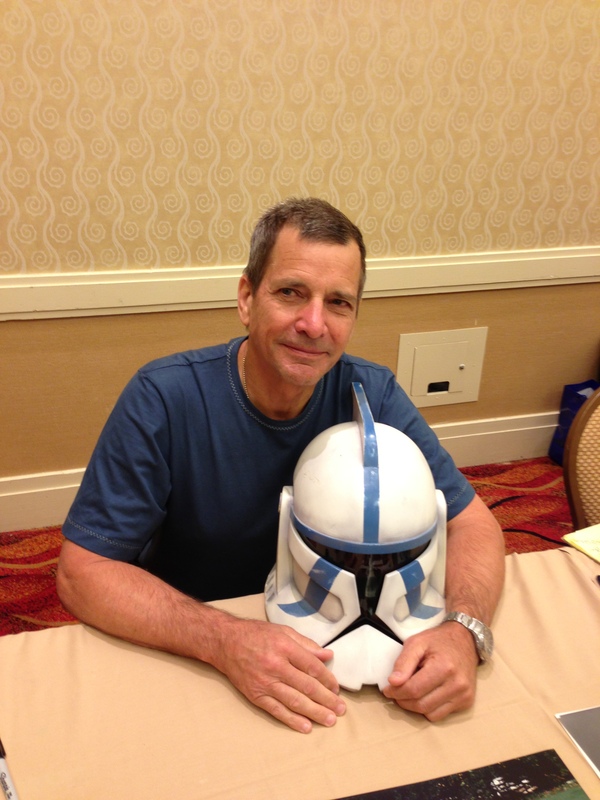 He suited up as Jango Fett on Saturday and I armored up in my animated clone trooper on Sunday. Even though I wasn’t suited up on Saturday, I still had fun watching my son (who set up his own booth this year) while also attending to the 501st and Rebel Legion joint booth. Part of the fun was walking around the small but humble convention and the other fun part was seeing everyone’s reactions to us being there. More than a few Star Trek fans came up and inquired how they could join up and become part of the Empire or Rebel Alliance, and we were more than happy to help them. This convention had the usual assortment of panels, photo opportunities, vendors and celebrities. The vendors and celebrities were in one room this year and it was a nice change. 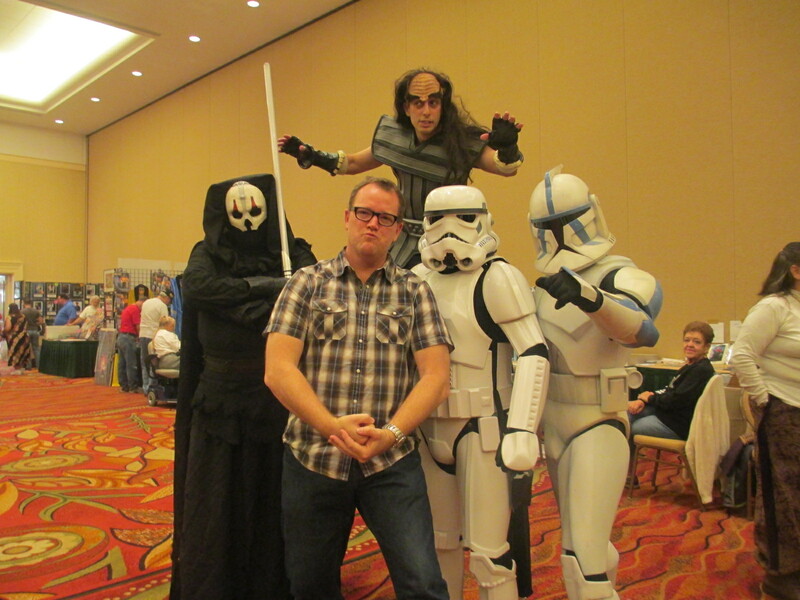 My favorite celebrity in attendance was Robert Duncan McNeill. I was too tight on cash to get my picture taken with him, or his autograph, but that problem was solved on Sunday when I was in costume with a few other troopers and he asked to take a picture with us. Another highlight of the weekend was meeting a high school crush of my mother’s, Dirk Benedict. Since he was under contract with Froggy Photos and not allowed to take a picture with me, I compromised and asked him to hold my bucket for my mom. At least that way she knew I was there and not making the whole thing up. As soon as I broke my own rule and removed my bucket in front of him, he was taken back at the fact that I’m a woman (most people are) and took a great picture for my mom. She was super excited to get the picture and Dirk was equally excited to hear the reaction she sent me back in a text. My armor was giving me a hard time that day so I only managed to stay suited up for around four hours. At the end of the day I accomplished what I set out to do: neet Robert Duncan McNeill and get a picture of Dirk Benedict. If you are ever in Orlando while Away Mission Orlando is going on, stop on by. For dedicated Star Trek fans, this is a must see event. Don’t worry about bringing the kids. This convention is family friendly.